Since its inception in 1997, Neha Herbals nurtures simple values of being close to nature, purity and being based in Science. 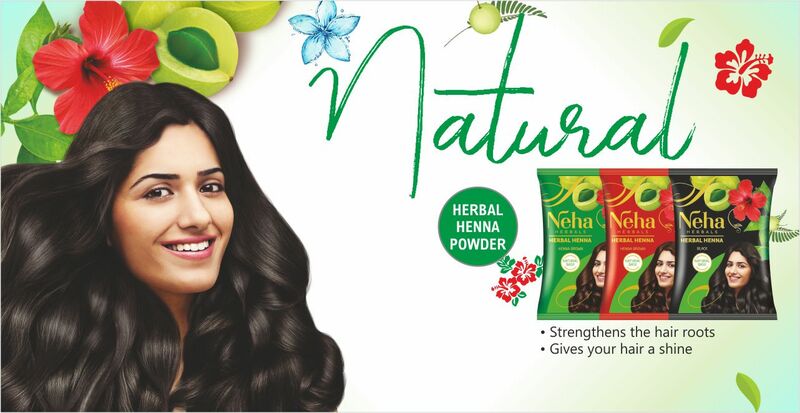 With a philosophy to embrace nature & science in the most balanced form, Neha commits to natural solutions. Our Hair care and Henna range comprises products that are gentle, effective and safe for long time term use. The Neha brand is synonymous with safe and efficacious herbal products. We formulate an excellent range of products by harnessing the most up-to-date technology, with the strong backing of a proficient manpower and 4 well-equipped production units. Our extensive network of over 900 distributors at the national and international level, make our products easily available to our customers the world over. Each and every one of our products undergoes a stringent quality control procedure, where they are checked on a number of parameters such as colour and fragrance, to name a few. Our complete range of products are made with raw materials bought from reputed suppliers, and are used in their natural form, without the addition of any chemicals. Our quality centric strategies percolate through every level of the manufacturing process, and ensure customers get nothing but the very best when they buy a Neha Herbals product. At Neha Herbals, we believe that nothing resonates more with the customer, than a product that delivers quality. In addition to this, our customer centric approach coupled with a good value for money proposition, has helped our products to be accepted across the globe. Countries in Asia, Africa, the Middle-East, in addition to Australia, the USA and Canada, have welcomed our wide range of products for their quality and benefits. At Neha Herbals, it is our constant endeavor to broaden our portfolio with natural and innovative products, and aim to formulate a wide range of beauty products for our customers. Each and every our products undergoes a stringent quality control procedure, where they are checked on a number of parameters such as colour and fragrance, to name a few. Our complete range of products are made with raw materials bought from reputed suppliers, and are used in their natural form, without the addition of any chemicals. Our quality centric strategies percolate through every level of the manufacturing process, and ensure customers get nothing but the very best when they buy Neha Herbals product. Neha Color Creme is the new make up. It comes in three beautiful shades: Natural Black, Dark Brown and Burgundy to suit every hair and personality. Neha Color Creme is enriched of natural ingredients like Henna, Amla and Hibiscus. It not only nourishes your hair but makes it incredibly soft and shinny. It is absolutely Ammonia free and also ensures 100% grey coverage. Our Color Creme comes in pre-measured sachets (color and developer). It is simple to use.Mix in a plastic bowl, apply and rinse. And you are ready to shine with a new look. Neha Herbal Henna is a herbal based product which gives natural colour for a longer period along with smooth, silky & soft hair. Available in Black, Henna Brown and Burgundy. Henna is the best natural conditioner that nourishes the hair and moisturizes the scalp. 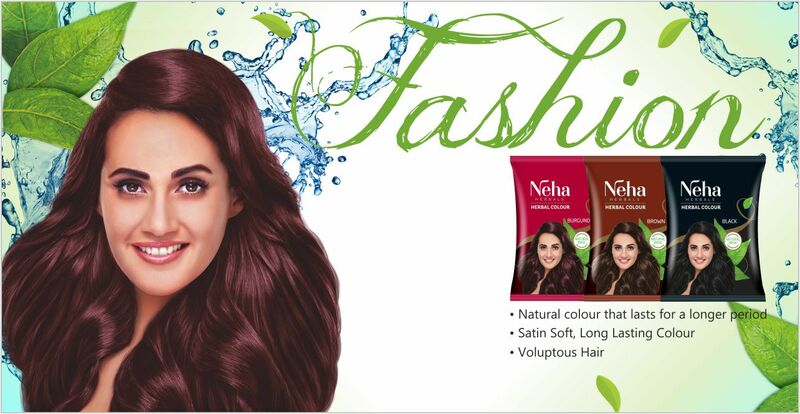 Neha Herbal Henna strengthens the roots of the hair and gives your hair a shinning colour. Neha Herbal Colour is natural, safe and causes no side effects.It is an exceptional blend of pure, high quality Henna, and a variety of herbs known for nourishing hair. Our Hair Colour spreads evenly and doesn't fade easily. Your hair gets a professionally finished gloss every single time. Available in Black, Brown and Burgundy it promises long-lasting colour and makes your hair strong and lustrous. The formulation is so gentle, that it retains the moisture content and protein levels of even the most delicate hair type. Try our range of natural products and see the difference for yourself. Made with organic natural extracts and ingredients like Amla, Neem, Green Tea, Shikakai and Hibiscus flower. 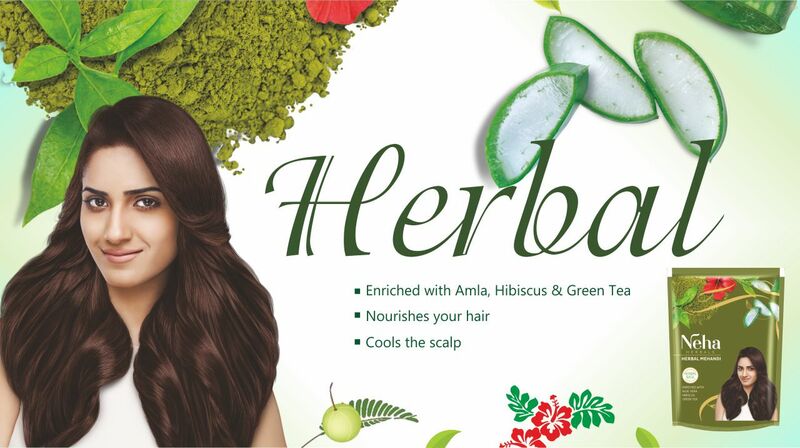 Neha Herbal Mehandi gives your hair a natural tone and fortifies it. Your hair feels nourished and is left with an incredible shade that you are sure to love. Moreover, it cools the scalp and leaves hair with a soft glossy and satiny texture. Neha Mehandi Cone is a natural product, made of the finest quality mehandi leaves. It is a Henna paste cone, ready to use and brings the original mehandi colour once gets dried. If you want to make your mehandi paste more vibrant and rich, you definitely need Neha Mehandi Oil. Mehandi oil has been used for decades to impart a rich hue to the henna. Whether you intend on colouring your hair, getting a temporary tattoo or even painting intricate designs on your hands and feet, you will be amazed at what difference the addition of mehandi oil to your henna paste can do. How to use Neha Mehandi Oil? 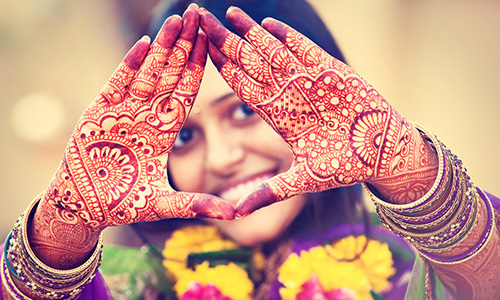 The rule of the thumb is to add 1 to 3 ml of Neha mehandi oil in 10g of mehandi powder. Do not exceed this quantity. If you are pregnant, avoid using mehandi oil, as it can be dangerous for your baby. Before using the oil, consult your obstetrician. It is best to perform a patch test before using the oil. This willshow whether you are allergic to it. Just use the Heena Mehandi Oil and enjoy the dark burgundy red colour that your mehandi leaves behind. Kali Mehandi is a Black Hair Dye Powder which is made of Henna to cover the grey hair. 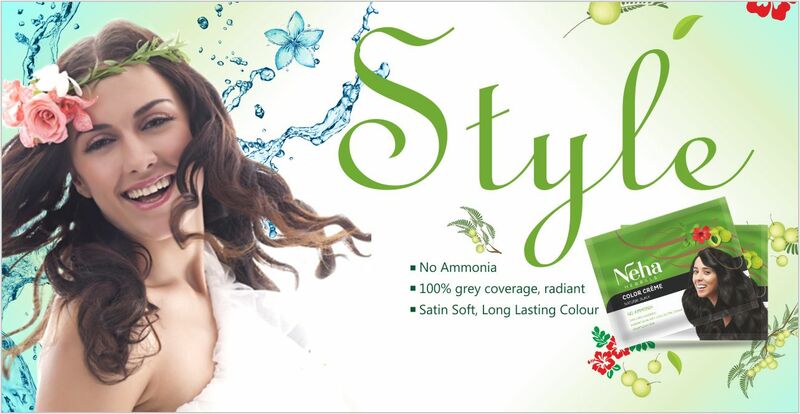 It is a natural color dye with only natural and herbal extracts in it. Its black color is due to the herbs added in it. It is completely natural and will leave your hair shining black. Neha Fast Colour is easy to use and gives instant results. Make intricate patterns, let it dry for 15 minutes and you are all set. The result is beautiful red designs without waiting for hours. It is available in tube format. A unique innovation, Neha Fast Colour Cone will take just 15 minutes to make stylish designs. It is quite easy and convenient to use. Take your pick from the vibrant colors: Pink, Orange, Blue, Green, Purple and red and shine on every occasion. Neha Rachni Mehandi is made using the finest handpicked Henna leaves. A number of wonderful and therapeutic ingredients are added to it, making it the perfect natural colouring agent. 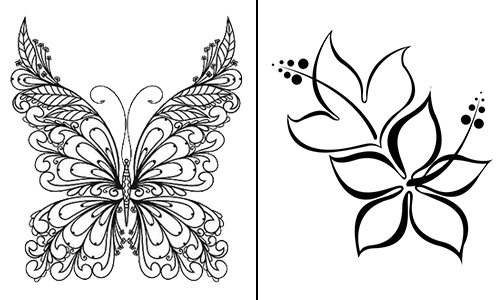 It is comparable to a natural and painless form of temprorary tattoo, as it imparts a deep colour and an elegant apperance to designs drawn on your hands and feet. The rich colour is a result of the quality of the Henna leaves. 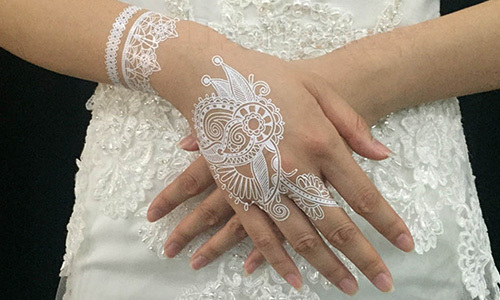 Neha Rachni Mehandi has been appreciated by customers the world over. Neha a Professional managed company is growing steadily meeting customers expectations and requirements. Neha is aiming at achieving higher target, backed by excellent technical guidance and knowledge. Our philosophy is customen driver and customer feedback that accelerate the learning and betterment of our prodcuts. To match the best in India and still be economical is what makes us a better option. Providing quality value for money products has been the philosophy and mission. Professionals are heading the Sales, Research and Development, Marketing, Production departments of the organization. Making a world-class product is one thing. Distributing and making them available to customers as and when they need them, is quite another. At Neha Herbals, our strong relationship with our national and international distributors has been one of the cornerstones of our company. At present, our network exceeds over 900 distributors who continue to collaborate with us, thanks to our dynamic support and superior products. It is our constant effort to widen our network and build associations that are mutually beneficial. If you want to partner with us, simply fill the below form and we'll get in touch with you. ₹ 2,25,000 - 2,50,000 P.A.